The use of frequency weapons upon humans toward behavioural control and murder is not new. 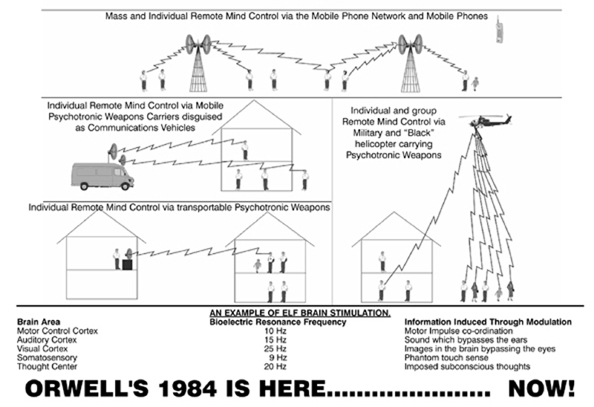 For well over 50 years, Neuro-electromagnetic Frequency Weapons have been perfected by their covert use in warfare. These 'non-lethal' or 'silent' weapons, as they are known in the trade, have also been perfected by experimenting on an innocent and unsuspecting public since their early development. Presently, thousands of individuals, from all walks of life, are claiming that they have become targets of assault and attempted murder by our Masonic secret government agencies and police hierarchy via the use of these weapons. Remote Mind Control Experiments, Behavioural Manipulation and Murder. INTRODUCTION - Covert Terrorism in the UK The British Intelligence Services and Police hierarchy are attacking and torturing innocent civilians via the use of their Frequency Weapons, towards Remote Mind Control Experimentation and Social Control. By George Farquhar. My Personal Experiences of being targeted along with my seven year old daughter as a Remote Mind Control Experiment by the Intelligence Agencies. By George Farquhar. Survivor's Testimonials of Neuro-Electromagnetic Mind Control Torture, who contacted Project Freedom to expose their experiences to society. Survivor's Testimonials of Neuro-Electromagnetic Mind Control attacks. From the "More Than Conquerors" web site (formally) "Mind Control Forum". The "heavies" of the Mind Control Police. This Black Government "Silent Weapons" technology has been developed to monitor and manipulate the minds of EVERY citizen - Wherever or Whoever you are! Mind Control in the U.K. Covert Operations Towards Behavioural Modification and Murder by the Intelligence Agencies. By Tim Rifat BSc BEd. Silent Weapons for a Quiet War. A secret military document exposed on the use of Remote Mind Control Weapons against humanity. By David Icke. The TETRA System Mass UK Mind Control Technology and the Zombification Of Britain's Police is Now A Reality. By Tim Rifat. Aerial Mind-Control The US Air Force's Commando Solo aircraft are used to broadcast subliminal radio-frequency messages to manipulate the minds of military and civilian targets: By Judy Wall. Microwave Mind Control Mobile Phones - Are they Killing Us? By Tim Rifat BSc BEd. used on you? By Fergus Day. Neural Manipulation An overview of Frequency technology. In 1961, Allan H. Frey provided evidence that the perception of sound can be induced in hearing by irradiating the head with low-power density, pulse-modulated, UHF electromagnetic energy; a type of radio wave. By Armen Victorian. Non-Lethality On April 22, 1993 both BBC1 and BBC2 showed a rather lengthy piece concerning America's latest development in weaponry - the non-lethal weapons concept. By Dr Armen Victorian. The Military Use of Electromagnetic Microwave and Mind Control Technology. By Dr Armen Victorian. Technology to Boggle Your Mind A short list of the hundreds of patents available which can be combined for use in direct or subliminal mind-control systems. Mind Control and the New World Order An expose on the intelligence agencies and their experiments with Remote Mind Control. By Glenn Krawczyk. In Your Head Experiments into Remote Mind Control methods has been well researched by experimenting on unsuspecting civilians since the 50's: By Jim Keith. Mind Control Towards Behavioral Manipulation and the U.K. An Overview of Remote, Individual and Mass Mind Control of Society. By Tim Rifat BSc BEd. The Pentagon's quest for nonlethal arms is amazing. But is it smart? : By Douglas Pasternak . Military use of Mind Control Weapons in the Gulf War. The use of Psychotronic Weapons in War and on Innocent Civilians. By Judy Wall. British Firm Told How To Irradiate Kurds British security company under investigation by Scotland Yard over an alleged plot to kill a guerrilla leader proposed the use of radiation to kill Kurdish prisoners. Esp of Espionage Military and Security Agencies uses of Synthetic Telepathy against "Internal Subversives". By Tim Rifat BSc BEd. Microwave Harassment and Mind Control Experimentation A report on the experiences of 25 survivors of EM Harassment, by ex-intelligence agent Julianne McKinney. European Parliament Resolutions Regarding Frequency Weapons Calls for an international convention introducing a global ban on all developments and deployments of weapons which might enable any form of manipulation of human beings. French Legislation against Frequency Mind Control Weapons The French National Assembly passed a bill on June 22 regarding mental manipulation. It will go to the Senate for a second reading at a date yet to be determined. Government Sanctioned Techno-Terrorism Speech and Report from CAHRE conference at DNC on Frequency Weapons. By Bill MacIntosh, Ex-US Navy & Submarine Personnel. Mind Control and the American Government In the late 1950's top CIA neuroscientist Jose Delgado prophesised a day when brain control could be turned over to non-human operators, by establishing 2-way radio communication between implanted brain and computer. By Martin Cannon. Subliminal Warfare ELF Extremely Low Frequency magnetic fields. They affect us all in ways we may never consciously realise! By Dr Robert Beck. Death Rays Methods of Mass Mind Control: By Jim Keith. Publications & Videos Exposing the Mind Control Police and their use of Remote Mind Control Weapons against society. Links to Neuro-Electromagnetic Frequency Technology and Survivors' Web Sites The facts of the truth are out there, to realize it, you only have to look! The Science of Radionics Can give us a basic understanding of how Frequency Weapons work. Over 14,000 Websites and documents. The Science of EEG Biofeedback Can give us a basic understanding of how Frequency Weapons work. Over 14,400 Websites and documents. CAHRA - Citizens Against Human Rights Abuse was formed by a group of survivors of alleged nonconsensual human experimentation involving electromagnetic and neurological weapon testing programs by the U.S. and other governments. "For the first time in history, one human being, from hiding, at a distance, can control the thoughts and actions of another, by way of undetectable hypnosis, using still-classified electronic technology." The Torture and Electronic Mind Control of U.S. Citizen John Gregory Lambros, a Native of Minnesota. Secretly the reality of a totally controlled society has been emplaced. While we were looking at political control, the technological mechanisms for a Big Brother state have already been installed. 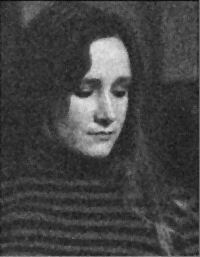 Barbara Hartwell a survivor of CIA MK ULTRA and PHOENIX Project, trained and utilized by CIA as a deep cover operative and professional CIA asset, under mind control programming, which the perpetrators of this mind control believed was "guaranteed under National Security". CAHE - Citizens Against Human Experimentation Reports of current experimentation with Microwave and EM weapons. More than Conquerors (formally Mind Control Forum) Exposing the use of Remote Mind Control Weapons. Hundreds of links to Survivors' Testimonials, R.M.C. Technology, protection methods and organisations. Mind Control, Techniques and Politics. Contains documents, links, references, and commentary related to mind control. Mind control is the term in common usage to describe covert behavior modification techniques and the use of neuro-influencing technology. The Government Psychiatric Torture Site "We need a program of psychosurgery for political control of our society. The purpose is physical control of the mind. Everyone who deviates from the given norm can be surgically mutilated. Man does not have the right to develop his own mind." Dr. Jose M.R. Delgado, Director of Neuropsychiatry at Yale University, and Top CIA Psychopath. Victims of CIA MKULTRA Mind Control by Ronald F. Garon. This website is dedicated to the victims of the CIA MKULTRA mind control program. This website is also dedicated to any victim of mind control, regardless of the program. Project Monarch and Montauk were also secretive mind control projects. The purpose of this website is to be a voice for the victims, and to make public what is happening behind the scenes. Mind Controllers by Ronald F. Garon. The Programs. The Goals & Objectives. The Weapons. The Victims. This is real, it's not a game! The Sponsors/CIA. Our Weapons/are Spiritual. Against Electronic Mind-Control A Finnish activist web site devoted to the study and resistance to implantation of human beings with neuro-radio brain implants. History of Illegal Human Experimentation and Electronic Mind Control Via Frequency Weapons technology. Stop the Covert War Are you a target of multiple stalkers? Are you being followed, harassed, or threatened? Is your phone tapped? You may be a Target of Covert War! The Science Behind Mind Control Frequency Weapons Experimental research techniques which can be detrimental or lethal in the hands of any but highly skilled, qualified experimental scientists. By Tom Bearden. Methods of Protection from Neuro-Electromagnetic Frequency Weapons. are making Marina Findlay's life a living hell.